There are just some people out there who are naturally gifted and we’ve been lucky enough to meet some of them at Picture Book Club. 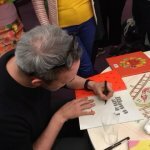 On Tuesday 13th March we were privileged to meet another one in the shape of award-winning author-illustrator Rob Biddulph. 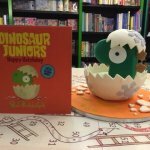 Rob’s new series Dinosaur Juniors is due to kick off with Happy Hatchday (Harper Collins) on 5th April. We were thrilled to be able to get our hands on a few advance copies for Picture Book Club! 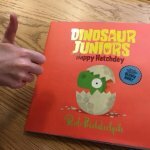 The Dinosaur Juniors series is aimed at a slightly younger audience than Rob’s previous picture books. Each one addresses a theme that will be familiar to all children. In Happy Hatchday it’s perceived rejection and acceptance. It received the seal of approval in our house! At the Picture Book Club meeting Rob talked us through his career and what had lead him to writing and illustrating. After a childhood of practice and honing his artistic talents, Rob became a successful magazine art director. His interest was drawn to picture books when he started reading them to his two youngest daughters (now 8 and 12 – if you want a flavour of the depth and breadth of Rob’s gift then take a look at his #PackedLunchPostIt series – pictures he still draws everyday for his daughters lunch box). 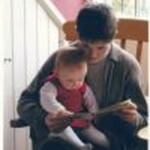 He began to develop ideas for his own stories and started submitting them to agents. Like many of us aspiring picture book types, when he found an agent he thought that he had made it! It is strangely heartening and dispiriting at the same time to hear that even for someone as talented as Rob it took 5 years before he got his first book deal. But what a deal it was! That was for Blown Away. It went on to win the Waterstones Book Prize (only the second picture book ever to do so) and the rest is history. 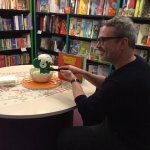 Rob now has an exclusive contract with Harper Collins and their successful working relationship continues with the release of the first Dinosaur Juniors title next month. As always at Picture Book Club, after hearing about Rob’s career we retired for cake. Rob was kind enough to sign books for members and he was kept very busy! Watching him sign books is a joy. Here is someone who is perfectly at home drawing. People who are gifted at something make what they do look effortless. That’s part of what makes them so good. For Rob I suspect drawing is a bit like breathing, something automatic that he can just ‘do’. It’s the same feeling I get watching Chris Riddell draw. That’s not to say that this ability makes it easy to produce a picture book. Rob explained that he usually works for 3-5 months on new texts, gradually bringing the words and pictures together. Meeting very talented people like Rob (and our other Picture Book Club guests) could be a bit intimidating for a mere mortal like me. It means I need to be a better writer if I want to compete in the crazy picture book market. But meeting people like that also makes me want to be a better writer, to make the best of the tiny facility with words that I might possess. Rob was a pretty good art director by all accounts (-; but in picture books, he is enjoying using his gift to the max. I don’t want to be Rob. I can’t be Rob. But after Picture Book Club on Tuesday, I want to be the best version of me that I can be. Hopefully, that’s something we can all aspire to.